At least 102 Yellow Vest protestors were arrested on Saturday in the French capital Paris, where the police officers used tear gas and water cannon on the protestors. At least 102 Yellow Vest protestors were arrested on Saturday in the French capital Paris, where the police officers used tear gas and water cannon on the protestors, Anadolu Agency reports. Champs-Elysees was calm at morning hours, however, tensions between the police officers and protesters rose in noon hours. The protesters threw stones to the police and the police used tear gas and water cannon against the protesters. In Bourges, central France, 500 protesters attempted to enter the historic city center, which the governor's office had banned protests. Also in the Netherlands, Yellow Vest protestors protested the government in 14 different cities including The Hague, Amsterdam and Rotterdam. The protests first started in France on Nov. 17, but quickly took on larger themes and also spilled over to other European countries. Thousands of protesters wearing bright yellow vests -- dubbed the Yellow Vests -- have gathered in major French cities, including the capital Paris, to protest Macron's controversial fuel tax hikes and the deteriorating economic situation. Under pressure from the protests, Macron announced a rise in the minimum wage and also scuttled controversial fuel tax hikes. At least 10 people died, over 5,500 others were detained, and more than a thousand others were wounded in the protests. 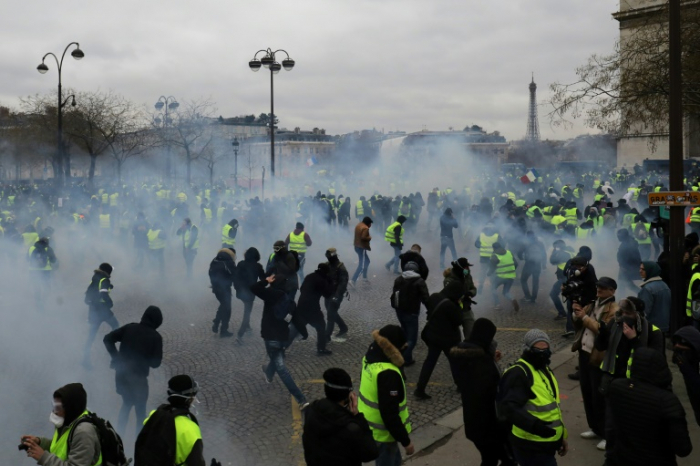 Protesters skirmished with police in Paris and other cities Saturday as thousands turned out for new rallies against French President Emmanuel Macron, with dozens arrested as officials vowed a crackdown on the violence that has marred the demonstrations since November, AFP reports.